Question: What part of a home or business do Americans ignore most? If you said, “The attic,” you would be correct! Property owners rarely visit their attics, unless of course, there is a visible problem. And then, it could be too late. Loss of heated or cooled air raises utility bills and causes discomfort for inhabitants! Old insulation materials can pose a serious fire hazard! Unwanted intruders, such as squirrels, rats and mice, can cause serious structural damage and spread disease! Attics cluttered with unnecessary debris can be taking up valuable interior space! At Quartz Solutions, we know the problems attics can cause, and are solely dedicated to restoring the health and safety of your attic. Our professionals can diagnose and eliminate common problems threatening your home or business. We seek out hidden breaches that allow precious conditioned air to escape! 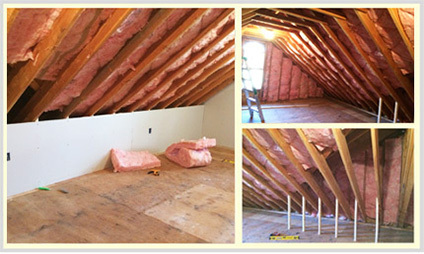 New insulation materials are carefully chosen to meet and exceed fire and safety regulations! Our experts find and eliminate pests living in your attic and damaging your property! We remove unwanted debris and suggest ways to improve the efficiency of your attic space! Bottom Line: Not only can we make your inhabitants safer and more comfortable, we can cut your monthly energy bills by up to 30%! Quartz Solutions is an industry leader in Attic Services, with an excellent reputation for quality among our ever-growing clientele. Our affordable services can turn your attic into a safe and functional extension of your home or business. When was the last time you took a good look at your attic? Contact Quartz Solutions at 201-205-2042, 973-536-1013 for a professional inspection of your commercial or residential premises. It’s free and there is no obligation. Got a question about your attic? Call us for advice over the phone. Contact Quartz Solutions and find out how we can turn a hidden menace into usable real-estate!